The decorations are up, as much as they’re going to be, presents are stacked on the table ready to be wrapped, and cookies are coming out of the oven! Christmas is just two weeks away and we even have a few inches of snow on the ground. Looks like we’re almost ready – how about you? 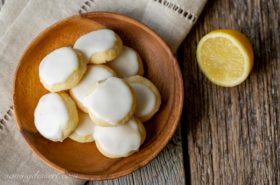 If you’re still looking for another easy, delicious cookie recipe, you’ll want to give these a try. 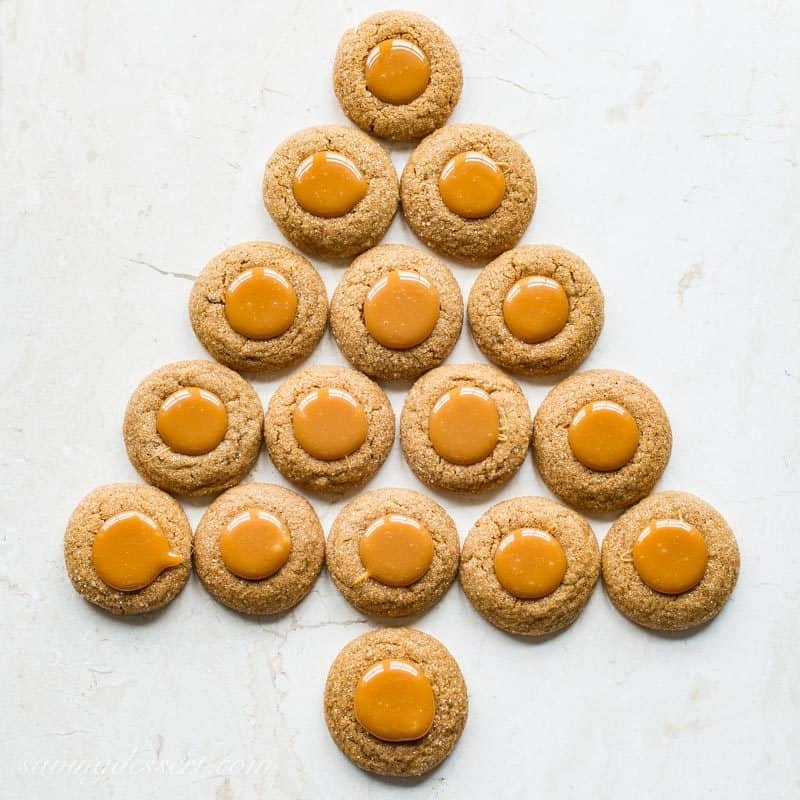 Molasses and ginger are a famous holiday couple, and now they happily welcome caramel to their fun cookie party! The classic flavor of Gingerbread is always a favorite in our house during the holidays. 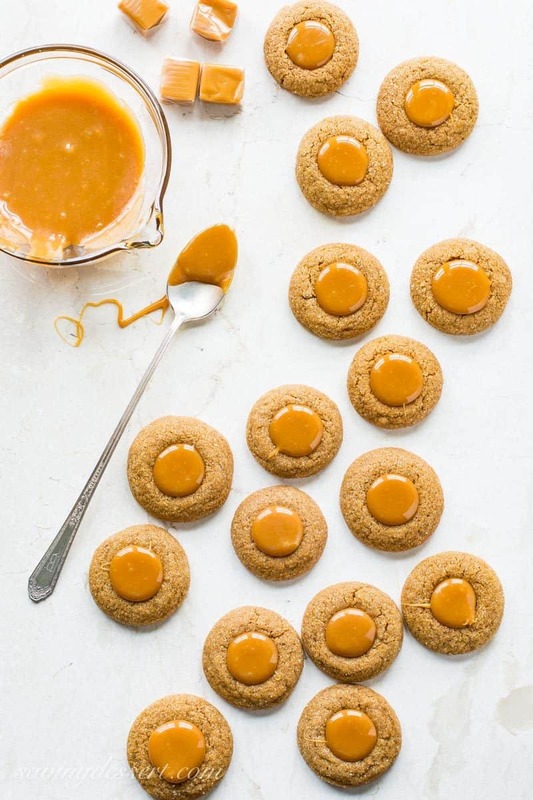 Our Ginger Molasses Thumbprint Cookies have plenty of ginger, and molasses, giving them great flavor without being overly sweet. Milky caramel just seemed like the perfect compliment to the spiciness of the ginger and molasses, and it is! A simple, easy and delicious cookie sure to please your festive friends and family. 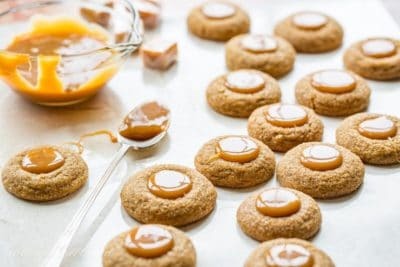 Thumbprint cookies are absolutely brilliant but if you prefer a plain ginger & molasses cookie, skip the caramel center and enjoy them straight from the oven! We fashioned these cookies after one of our favorite recipes for Soft Ginger Molasses Cookies with Pumpkin-Butter Buttercream. 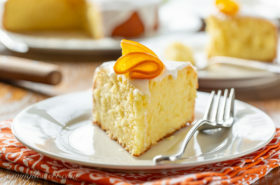 They’re also terrific without the sweet filling so take your pick – two great recipes perfect for the holidays! Don’t forget our oh-so-delicious Gingerbread Whoopie Pies with a lovely Lemon Cream Cheese Filling. They check all the boxes for a ginger molasses cookie, and classic gingerbread cake all in one bite. Finally, we always love making our classic Gingerbread Cookies cut into festive snowflakes, trees or gingerbread men. So much fun to decorate! 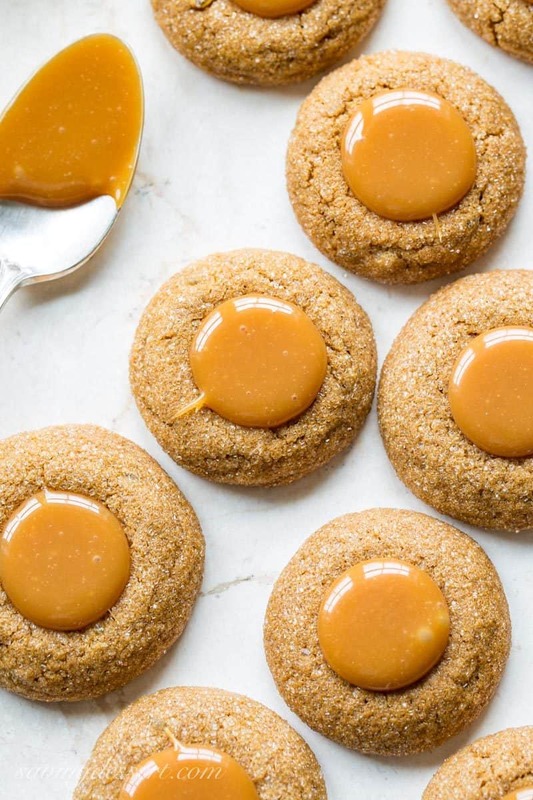 These cookies are best stored in a single layer at room temperature, but if you don’t mind a little chewier caramel, pop them in the refrigerator for a longer shelf life. In a medium mixing bowl, whisk together the flour, cornstarch, soda, salt, cinnamon, cloves and ginger. Set aside. In a large mixing bowl combine the butter and brown sugar. Beat on medium until the mixture is light and fluffy. Add the molasses and vanilla and blend until smooth. 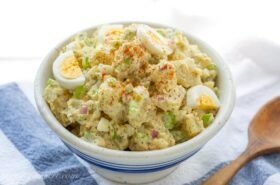 Add the egg and beat until blended. Scrape down the sides and bottom of the mixing bowl and blend again to incorporate. Add about 1/3 of the flour mixture and mix on low until incorporated. Repeat until all flour is blended. Add the candied ginger and blend on low just until incorporated. Scrape the sides and bottom again with a rubber spatula, and blend one more time. 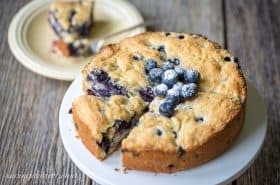 Cover the mixing bowl and refrigerate 1 hour. Preheat oven to 350 degrees. Line two baking sheets with parchment paper. Pour about 1/4 cup of the coarse or granulated sugar into a shallow bowl for rolling. Scoop out some of the cookie dough using a 1-inch cookie scoop or tablespoon. Roll the dough into a ball, then roll the ball in the coarse sugar. Place the cookies on the baking sheet at least 2 inches apart and freeze for 15 minutes. Bake the cookies in a preheated oven for 10-12 minutes. Remove the cookies from the oven, and using the back of a 1/2 teaspoon measuring spoon, make an indentation in the center of each warm cookie. Transfer to a cooling rack and let cool completely. Fill with 1/2 teaspoon of the caramel filling. Cool until set, about 30 minutes. Microwave the caramels and cream in a small bowl, stirring every 30 seconds until smooth, about 1 to 2 minutes. I’m loving all the ginger recipes these days and have moved these Chewy Chocolate Ginger Cookies from The View from Great Island to the top of my list! How about this Gingerbread Martini and Homemade Gingerbread Syrup from Nutmeg Nanny? How delicious they must be! And last but not least, I really want to make these White Chocolate Gingerbread Blondies from Bless this Mess. Thanks so much for stopping by! Happy shopping, baking and gathering! I bet this combination of flavors is magical together, sounds like you are in good shape for Christmas, Happy holidays Tricia! 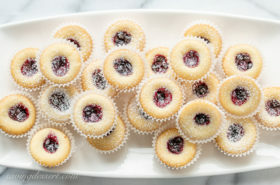 I’m almost done baking – hope you’re having some fun in the kitchen too. Merry Christmas Cheri! This combo sounds absolutely divine. Perfect for the holidays!! Thanks Cathleen! Great to hear from you – hope you are doing great! I made a similar cookie with lemon curd filling but now that I have the caramels in my head I’ll have to make it again, yours look yummy. Those cookies look so good. I enjoy gingerbread cookies, especially when they are filled wit caramel . 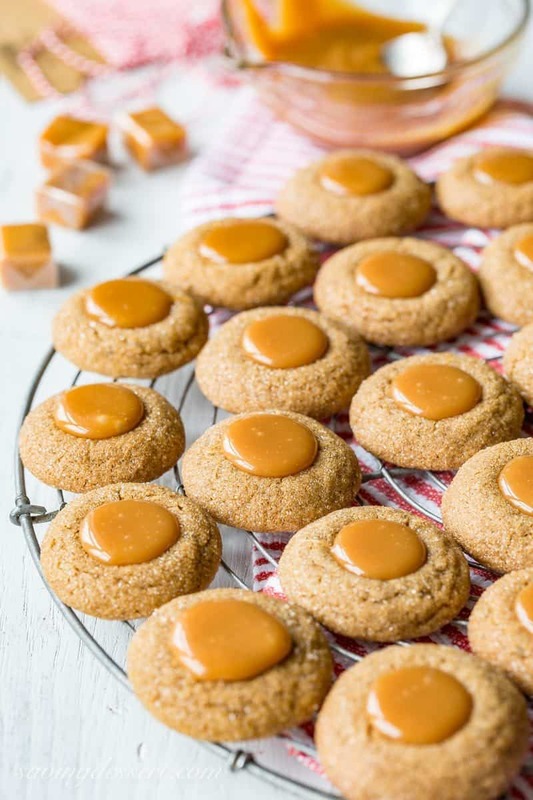 These are good cookies with our without the caramel – but for some reason, the caramel doesn’t seem very sweet and balances the bold flavor of the molasses in the cookie. A delicious combination! Haha – thanks Susan! These are too easy to pop in your mouth. Everyone has enjoyed them – thank goodness I had help! They are spicy Sue – and the caramel really balances the flavors. Wish I could share with you! I’m baking ginger cookies right now so my house is filled with an amazing aroma. They’re not as pretty as these though. I love the idea of caramel and ginger, delish! Can’t wait to see your beautiful cookies Chris! A great idea combining thumprint and molasses cookies in one! Festive and delicious! Thanks Angie – these have a great flavor and I love the crisp exterior and creamy middle combo 🙂 Have a terrific week!